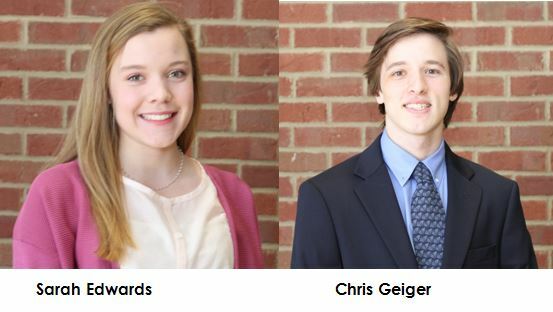 (Clarkesville)- Two White County youth, Sarah Edwards and Chris Geiger, both of Sautee, have been selected to attend the 54th annual Washington Youth Tour. Edwards and Geiger are juniors at Tallulah Falls School. They were selected through an application process which included a test and interview. Habersham Electric Membership Corporation spokeswoman Nicole Dover said, this “once in a lifetime” youth leadership experience is made possible through the generosity of the electric membership cooperatives (EMCs) in Georgia, including Habersham EMC.” This year’s tour, which takes place June 13-20, will expose students to the fast-paced world of politics and leadership. While visiting the nation’s capital the delegates will have the opportunity to meet with their elected officials to discuss and learn about important local issues. This Georgia delegation will join more than 1,700 other youth representing cooperatives across the nation. Since 1965, the Washington Youth Tour has given more than 3,000 students from Georgia and more than 50,000 nationwide the opportunity to take part in this unique experience.